Today: It's time to put a lid on our Tupperware woes. Easy to store, economical, and available in a bevy of sizes and shapes, reusable plastic storage containers are an indispensable part of every modern pantry. The newly popular glass storage containers are also a great (and more eco-friendly) option, but they aren’t as widespread -- and they're a bit pricier. 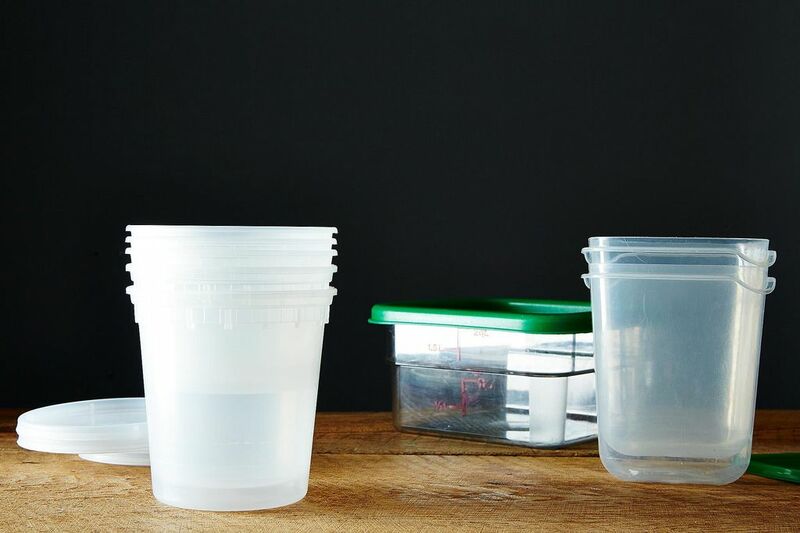 Whether you use Tupperware or its numerous brethren, these sturdy, lightweight containers are ideal for storing food in the fridge and for takeaway lunches; but they can also be a headache to store and clean. So as the back-to-school season carries on, we’ve investigated the best ways to keep your plastic containers clean, odor-free, and ready for everything from PB&Js to grain salads to wintry soups. Do a preliminary rinse (and wash if possible!) the moment they’re empty. The first step to eliminating food smells from plastic containers is to wash them at the earliest possible moment. A thorough wash with hot water and dish soap is best, but a water rinse before a later wash is helpful, too. Store them with a pinch of salt. Although Thai curries and other pungent foods make for an exciting desk lunch, they often leave lasting smells in your storage containers, even after washing. Adding a large pinch of salt to these containers will rid them of the scent so that your turkey sandwich doesn’t taste like green chiles and coconut milk. Make sure to wipe out the bottom and inside of the containers before using them though, or you’ll encounter a mouthful of salt! Expose them to direct sunlight. Yes, sunlight improves almost everything. Placing containers outside on a sunny day will air them out and take advantage of the sun’s natural ability to fight odors. Store them overnight (or longer) with newspaper. Don’t ask us how or why it works, but persistent smells in plastic food containers are often eliminated by newspaper. Place the crumpled newspaper inside, snap on the top, and store overnight or longer. Remember to wash with soap and water after, since newspaper’s not always known for being hyper-clean. Wash them on the dishwasher’s top rack. If placed on the bottom rack of the dishwasher, plastic containers may come into contact with the washer’s super-hot areas, causing them to melt and warp. Place them on the top rack to avoid shape-shifting during the wash. Remove stains (and odors) with baking soda. 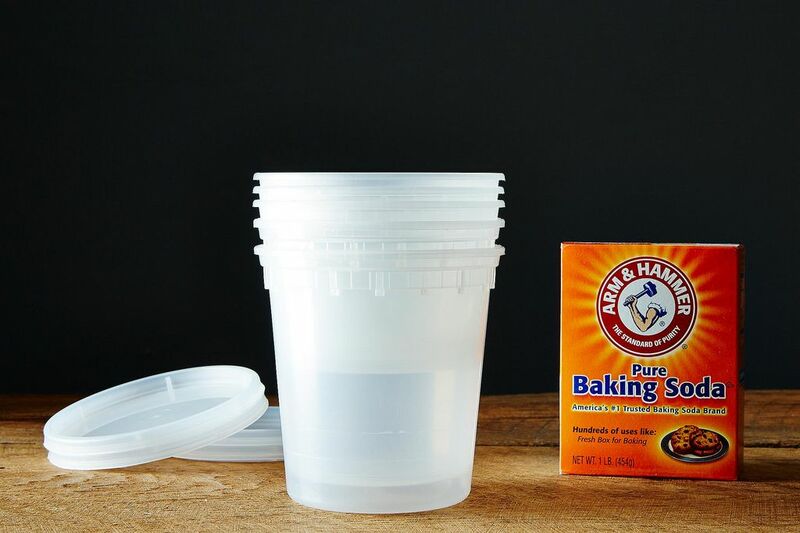 Baking soda’s cleansing properties are nothing new, and work as a great stain and odor remover for Tupperware, as well. 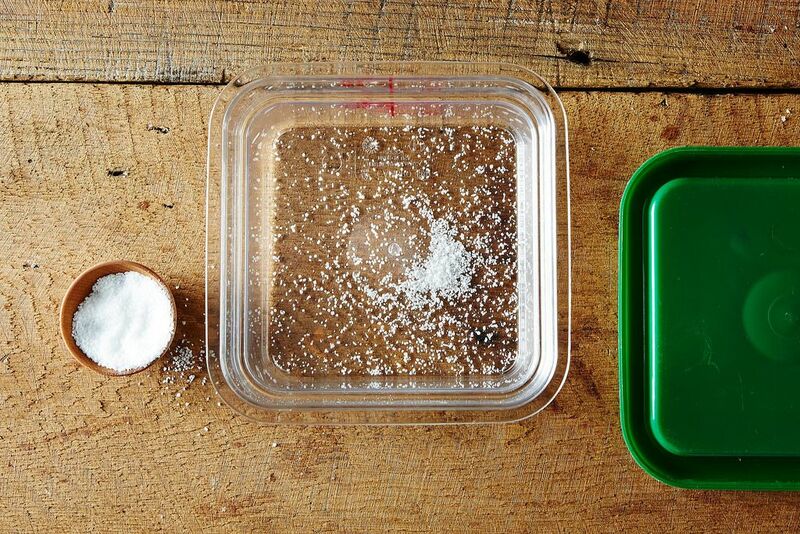 Simply make a thick-ish paste of warm water and baking soda and rub it into the inside the container. Let it sit for at least one day, then rinse it out thoroughly. Continue until no stains remain and the container smells fresh. Stay organized! Don’t keep every bottle or takeout container you accumulate, and keep all of your lids and containers together. While it’s tempting to re-use each and every wonton soup container or jam jar (kudos for thinking eco! ), this will create extra clutter among your food storage collection. Nothing’s more annoying than neatly placing something in a container to find you don’t have a top that fits. Store all of the lids in a large bin or pot, and stack the containers nearby with one lid on the top of the stack to prevent dust. How do you keep your plastic containers tidy? Tell us in the comments! I use plastic containers for freezing homemade chicken stock. Even after thorough washing, they’re left with a tacky residue and smell funky. Vinegar didn’t help, but washing again with Dr. Bronner’s Sal Suds and hot water did the job. It has more cleaning power than dish soap and cuts the grease. Nutmeg and a bit of soapy water. Fill to top and let sit overnight. Repeat if necessary. A little nutmeg goes a long way. I have had no luck with vinegar, lemon, baking soda, newspaper, chlorine, ammonia. The nutmeg kills the odor of fish, garlic & onions, and other smelly things. Now I try to put my salsa, anything garlicky/oniony, fish, ceviches in glass jars for storage in the fridge. Can't believe I missed this the first time around. I've made a big effort to get rid of all cleaners with potentially toxic chemicals in them. Simple sunlight is a revelation. I clean my wooden cutting boards (wood also has anti-bacterial qualities and is self healing from cuts-unlike plastic) with salt and then rinse and set in a rack in the sun (on my fire escape:) They never smell of onions and I never worry about them having old bacteria on them. Sunlight is an awesome germ killer. I'll try the newspaper thing for odors too! Why is that funny? Tupperware is alive and well. I am also a Tupperware Independent Consultant-it's officially how Tupperware refers to us. It helps pay MY bills! I am a Tupperware consultant, and first of all the containers pictured are NOT true Tupperware products. With that being said, a much faster way to remove, at least smells, from any Tupperware container is to crumble a piece of newspaper and place it in the container, close the lid and let it sit for about a day or two. I gave this tip to a lady that had an onion smell in one of her pieces and she couldn't say enough on how well it worked for her. And yes, newspaper is great for absorbing odors! Choice of material matters. In particular, I use polycarbonate for items that have strong scent (onions, garlic, for instance). Polycarbonate can be recognized as the very hard, very clear, tough plastic used for most Cambro products. ummm, The picture you used is NOT Tupperware. Its cheap plastic. Tupperware does not usually have this problem. Oh by the way, vinegar and baking soda are good for oder removing as well. Dawn works really good. Other wise I would suggest putting smelly things like onions into a glass jar or container with lid. Also, one other tip, for onions, put just enough water in the container to cover cut side, I have noticed less issues with oders this way. DONT drowned it, just enough to keep the cut side form wilting. I like using Ikea containers - the same size lid fits on several size containers. I'm sure Tupperware has no issue with you referring to all plastic containers as "Tupperware". It's known as a "Generic Trademark" and usually signifies a brands dominance in the market. Tupperware is in good company with companies like: Zipper, aspirin, vaseline, band-aid, kleenex, Frisbee, Yo-Yo, Trampoline, and Escalator. The opposite of what Will said is true. Companies like Tupperware Brands do not want us using the name generically. If they allow it, they can lose their trademark. Aspirin and escalator are examples of names that are no longer trademarks in the U.S. Frisbee, Band-Aid, and Tupperware are examples of names that are. I agree. And even if Tupperware does mind, who cares? You'd be wrong that Tupperware wouldn't mind. They DO have copyrights. Wash with hot water and Dawn dish detergent. Rinse with ice cold water. NO odours will be left. PBW, Powdered Brewers Wash. PBW is a patented alkali cleaner originally developed for Coors, It's what brewers use to clean their metal and plastic pieces that they can't scrub. PBW is environmentally friendly, biodegradable, and will not harm septic systems. It will get he stain and smell out of just about anything. Don't use it on aluminum as it will oxidize.